Posted on January 27, 2019 by DanielC. 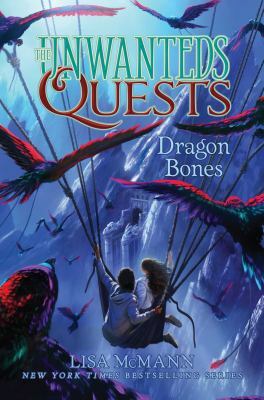 The last book I finished before my winter break was Dragon Bones, part of the The Unwanteds Quest Series written by Lisa McMann. The story follows two young twins, Thisbe and Fifer. Thisbe has been captured by the evil Reviner and must be rescued. The story follows both girls, switching perspectives and showing the reader the struggles of both girls. The climax of the story is when Fifer gathers a group of her friends, who try to find and rescue Thisbe. Everything is going as planned until the gang encounters the Reviner. Alex, Fifer’s brother and lead wizard, starts to fight the Reviner but is quickly overrun. Eventually, Alex is killed and because he is the lead wizard, once he is gone, all of the magic the group used no longer works. Without their magic, Fifer’s group loses all their fighting ability. They quickly lose their confidence and are forced to retreat, leaving Thisbe behind. Little do they know, Thisbe and a friend of hers that she met while captive, had already escaped and are trying to survive until help arrives. Overall, I thought this book was very well written. I like how the author switched perspectives between the two twins, so you could see what was going on in each of their lives. The ending was cliche and expected, but that was the only problem I had with the book. I would rate this book a strong eight out of ten and would recommend the story to middle schoolers. Dragon Bones and the rest of the Unwateds Quests series is available for checkout from the Mission Viejo Library. This entry was posted in Book Reviews and tagged adventure, brothers and sisters, dragons, fantasy, magic, siblings by DanielC.. Bookmark the permalink. Sometimes it’s hard to find good fantasy books, but this seems interesting. I might have to check it out sometime!